Eraldehyde model E-300 is a superior air cleaner designed to remove formaldehyde and other carcinogenic Volatile Organic Compounds from large rooms on your own custom timed, automatic schedule. It safely cleans the air in rooms while they are occupied. It is also ideal for use in bedrooms of ill patients and children exposed to bacterial and viral infection because it kills airborne germs using germicidal sterilization in the air flowing through the unit. 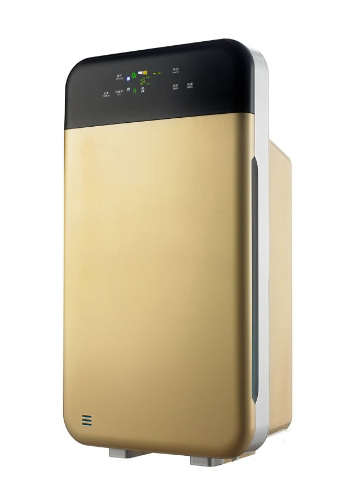 A floor standing, designer-styled, three-speed portable unit, it works quietly to exchange room air over 3 times per hour in a large (338 sq. ft.) room. Its dimensions are 13 inches wide, 8.5" deep, and 24" high. The unit uses a multi-stage process to purify your air. Large dust particles are removed by a coarse, cleanable pre-filter. Miniature allergen particles are removed by the integral HEPA filter. The E300 also captures, retains, and destroys carcinogenic formaldehyde and other lethal VOC's suspended in breathable air, including benzene and phenol that are listed by the EPA together with carcinogenic formaldehyde as being "Most Dangerous". The unit also has two selectable infection control features to assure germ destruction: (1) a "Sterilization" push button that activates germicidal UVC radiation of the enclosed airflow to sterilize smaller microbes, and (2) an "Ionization" push button that activates production of high concentration aero-anions at 10 million pcs/cm3 to reduce spread of the smallest viruses. The unit includes a hand-held remote controller for ease of operation across the room or without leaving a bed. A selectable multi-hour timer feature also lets the user set the Auto-sleep feature for your convenience. The E-300 uses the EC-301 cartridge set which will last 6 to 9 months depending on your usage. This unit uses the EC-301 cartridge set which can last 6 to 9 months depending on usage. This is a consumable item. Returns and refunds for product manufacturing defects. One-year warranty on parts if equipment is mechanically or electrically defective.